More than ever before, as a nonprofit manager, you want and need practical guidance on how to do your job and run your organization more effectively and efficiently. 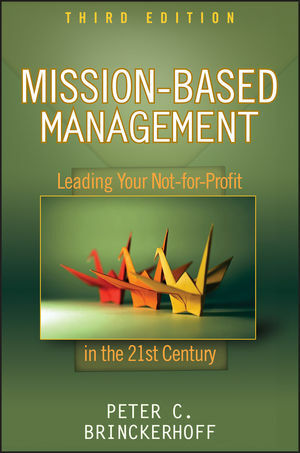 And more than ever before, Mission-Based Management, Third Edition provides the definitive answer. Peter C. Brinckerhoff is an internationally renowned trainer, author, and consultant to nonprofit organizations. He brings years of experience in the field to his work, as he is a former board member of local, state, and national not-for-profits, and has worked on the staff and as executive director of two regional not-for-profits. Since founding his consulting firm, Corporate Alternatives, in 1982, Mr. Brinckerhoff has helped thousands of organizations become more mission-capable. He is the award-winning author of Mission-Based Management, Third Edition; Social Entrepreneurship; Mission-Based Marketing, Second Edition; and Faith-Based Management, all published by Wiley. A look at three core philosophies, who the book is written for, how the book is designed, and how to get the most from reading it. Chapter 2 Where We Were, Where We Are, Where We're Going. A brief history of the nonprofit world, an examination of the relationship between nonprofits and their funders, and an updated prediction of the nonprofit world for the next ten years. Chapter 3 What Works: The Characteristics of a Successful Nonprofit. An updated list of the ten things that a nonprofit needs to continue to do its mission well in the twenty-first century. Chapter 4 The Mission Is the Reason. How to get the most benefit from the reason that nonprofits exist. For many, the mission is an underutilized resource. A discussion on updating and then using a motivational mission statement. Chapter 5 Being Ethical, Accountable and Transparent. Effective nonprofits are highly ethical, accountable to their communities and transparent both inside and outside the organization. The best ways to do this on the highest moral plane possible is covered. Chapter 6 A Businesslike Board of Directors. What an effective board is, and what the board's and the staff's respective roles are. Reducing board liability and recruiting and retaining a board will be covered as well. Chapter 7 Leading Your People. A new approach to nonprofit leadership that succeeds in today's high-speed, information-driven environment, also including better communications, evaluations, and rewards. Chapter 8 Embracing Technology for Mission. How to use technology to better serve, manage, inform, market, empower, and compete in today's all-tech, all-the-time environment. Chapter 9 Creating a Social Entrepreneur. How to develop a culture that takes reasonable risks on behalf of the people it serves. The criteria of a social entrepreneur. How to focus on your core competencies and remain flexible. Chapter 10 Developing a Bias for Marketing. The best way to bring your entire team into the marketing process, to discover who your markets really are and how to meet their needs and wants. The characteristics of a market-driven and mission-based organization. Why asking is so important. The eight key characteristics of a financially empowered nonprofit, better internal reporting, and how a nonprofit can keep what it earns. Chapter 12 A Vision for the Future. How to plan where you are going, and how to get the most from the planning process as well as from the plan itself. Sample plan outlines. Chapter 13 The Controls That Set You Free. The way to get the most from nine different kinds of policies, including a tested method for their development and enforcement. Chapter 14 A National Agenda: Empowering Our Nonprofits. A new way of looking at nonprofits for everyone to consider: funders, donors, volunteers staff, board, the public and the press. What we all need to do together to improve, free, embolden, and empower the not-for-profits that are so essential to our community.